We’re not just building sites for Australian businesses, but also international businesses. Check out our latest projects for 2018. We built Cash For Cars Australia on behalf of Melbourne’s Cheapest Cars. It allows website visitors to sell their cars online. We achieved this using a simple contact form on a cascading website page. On-site managers will organise an assessment of the vehicle and will provide a fair price in exchange for their car. This Jim’s division uses the custom website template because it creates a constant branded image. 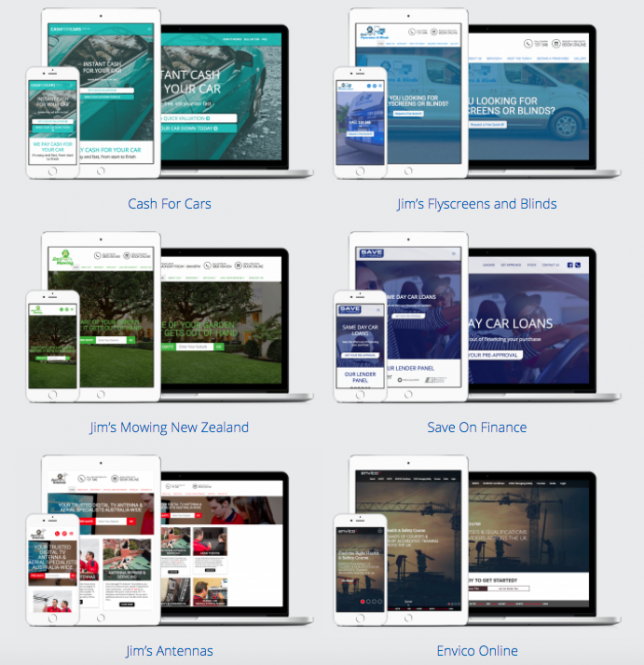 Also utilising the Jim’s branded template that we’ve created is Jim’s Mowing New Zealand. Save on Finance Australia is a simple cascading page website. It also features a custom-stock feed. The Webtron Jim’s branded template is also used on the Jim’s Mowing Australia website with optimised video content to showcase the brand. The Jim’s Mowing Canadian franchise also uses the Jim’s template we’ve built. Envico Online is based in the United Kingdom and is one of the UK’s most well-known providers of online health and safety courses. Jim’s Antennas also uses the standard Jim’s website template created by Webtron. Located outside of Australia? Webtron has the tools to help your business get ahead of the competition regardless. So you should contact us, and see how we can help your business thrive online.